Twenty-nine. 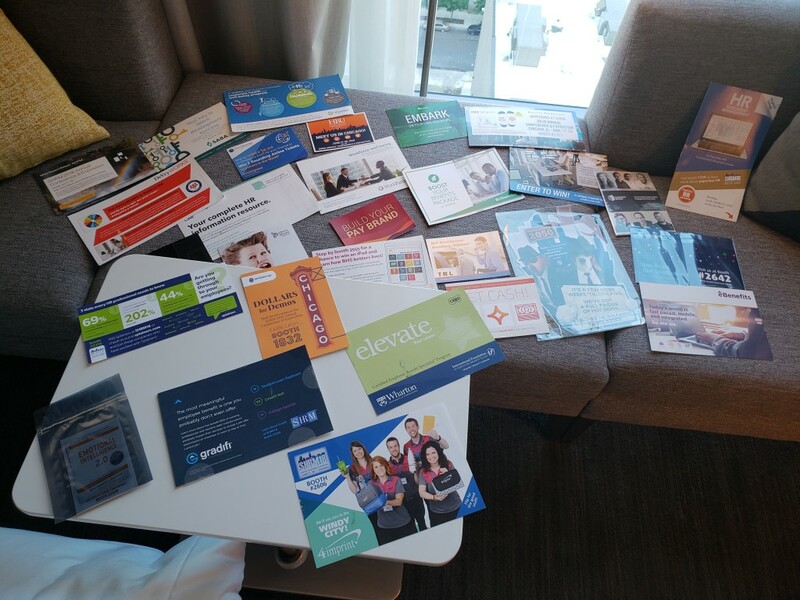 That is the number of pieces of mail I received from vendors in the lead up to the opening of #SHRM18 in Chicago tomorrow. That’s a nice assortment of pre-SHRM mail. As someone who has been blessed to attend multiple of these annual extravaganzas of everything HR, I have gotten used to some of the mailings and the content they contain. Some vendors appear to use the same thing each year. For example, I can count on TalentSmart to have their shiny mailing envelope containing a mini flyer advertising the book Emotional Intelligence 2.0. It’s 50% off at their booth this year. Each year also brings mail from institutions of higher education touting their Masters programs, law school, or even industry certifications like CEBS. A new one for my noticing this year was from Houston Baptist University with their on-line Masters in Human Resource Management program. One element that I have noticed before was a couple of exhibitors touting student loan debt management. I know this is a growing area of benefits that companies are exploring (adding to existing tuition reimbursement programs) as many of the new hires coming into companies have large amounts of debt. This, of course, could be another arrow in the quiver of talent acquisition in a challenging recruitment environment. In this age of electronic communication and mass e-mails, some may think that sending a conference tease or booth invitation by “snail mail” may not be effective. I would argue differently. As our e-mail becomes overwhelmed with junk, spam, and other distractions, these pieces (when well designed) can prompt a look at something that an attendee hasn’t considered before. For me, this will be electronic document management. While we have one in place, I am hoping to see some upgraded capabilities. The folks at ColumbiaSoft will be first on my list as I peruse the exhibition for potential solutions. Why is that? Because their direct mail reached my office and caught my attention. While I LOVE e-mail, don’t discount the old fashioned method of marketing either. This entry was posted in HR Practices and tagged #SHRM18, AllegroHR, HR, marketing, sales, Vendors. Bookmark the permalink.